Tanya Durni: Hi Rich and Anne Marie. Thanks for agreeing to share some more information regarding your personal knowledge of the Church of Scientology. Tanya: So tell me about L. Ron Hubbard, what you knew about him when you first became involved with the Church of Scientology. Rich: We knew nothing about Hubbard before our first visit to the Church. Then after being introduced, we only knew what we had been told about him. Unfortunately, we had no reason to doubt the information we were being spoon feed. We were told he held several degrees from various universities, was a nuclear physicist, served in combat, was a “war hero”, decorated, Purple Heart and all. Tanya: Funny you should mention the Purple Heart. 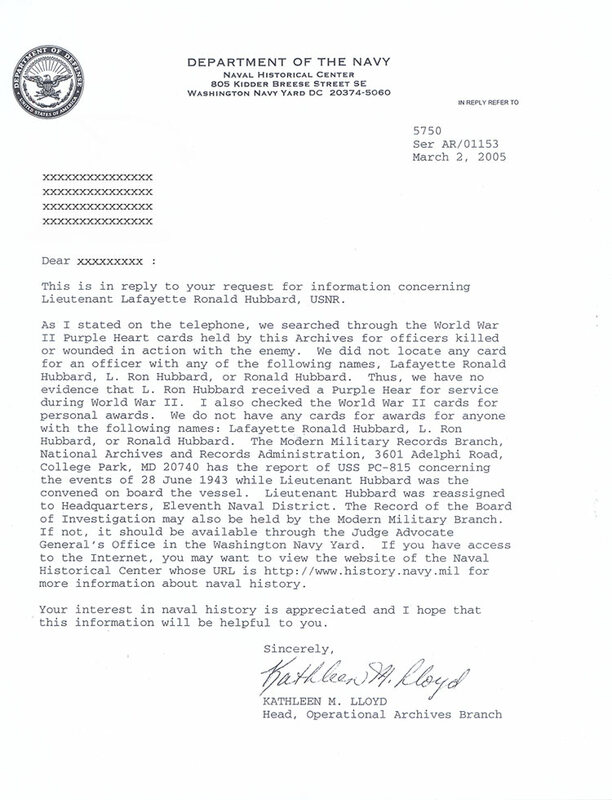 Here’s a response that was received from the Department of the Navy regarding Hubbard’s Purple Heart. Rich: Amazing, the Church of Scientology is just built on lie after lie. Tanya: Here’s what his son had to say about Hubbard in a court affidavit. So Anne Marie, anything you want to add? Anne Marie: Well, lets see… I was responsible for cleaning Hubbard’s office. The office that was kept for his return to earth, even though he died in 1986. Tanya: Yes, I understand quite a bit of effort is kept in maintaining his tax free office. Anne Marie: There was a specific way that it had to be cleaned and only certain cleaners were to be used, unscented ones. Tanya: Oh. That probably has to do with the fact that Hubbard didn’t like perfumes. I found Jesse Prince’s essay, “Why Scientologists Don’t Use Scents,” very interesting regarding that phenomenon. Anne Marie: There was a pack of Kool cigarettes kept in the top right hand drawer of the desk. Everything had a place and never moved. Except… the policy letter. Every week we would change the policy letter that was on top of Hubbard’s desk. Left, like he had just written it. Thinking back, it was freaky, really. Tanya: I guess it is a way to build up Hubbard’s image though, to the members. Anne Marie: You know, I just thought of something interesting. Inside the Org, upper management never used email. It was believed that email was easily intercepted. We used telex discs. They came encrypted and only certain computers had the encryption program. You also only picked up your own telexes. You would NEVER be able to access, say the Executive Director’s or someone in the Sea Org’s telexes. HCO was in charge of downloading the telexes to each persons’ disc and they also sent them after the person responded. Not just anyone was allowed to do that. You only had a small window to answer telex’s. It was very secretive. Tanya: What sort of information was transmitted in these telexes? Anne Marie: A lot of them were reprimands for not having done something or if you were late in answering questions. You only had a small window of time to answer telexes. It was really weird. Anne Marie: I just read the book, “Digital Fortress” by Dan Brown and it was about computers and encryption codes. That’s what made me think of that. Tanya: So what else comes to mind, that you might want to share? Anne Marie: The mail drop. Anne Marie: Yes. We were always reporting up lines to the New York City Org. Our correspondence would have to be packaged, twice… then all taped up… then taken to the bus station. Anne Marie: Yes, the bus station. We never used the US Post Office. If we missed the bus delivery, then we would drive to the airport with our package and put it on a plane. Tanya: How often was this done? Anne Marie: A couple of times a week. There were always deadlines that had to be met, stats to make, money to bring in. Tanya: Speaking of money, you mentioned in our chat on April 4th, that you weren’t paid your commissions from your sales. What do you suppose happened to those? Anne Marie: My direct supervisor, Jeff Carlson never paid me those commissions. One can only imagine what he did with the money. Looking back, I am glad I didn’t receive those, because it would have been money earned under false pretenses. I don’t want that on my conscience. Rich: Jeff Carlson is a good con artist. I sometimes wonder who he is fooling. The problem is that the members delude themselves, all the while attaining a feeling of power and invincibility. It is a very downward spiral. Tanya: Since your on the topic of power and invincibility, didn’t you mention earlier tonight that you ran into Buffalo Org staff member, Sue Rusnak in the grocery store? Rich: Yes, as a matter of fact I did. Tanya: Did she acknowledge you? Rich: She took one look at me and you’d have thought she saw a ghost. She ran away before I could even get out the word “hello”. Tanya: So all that money and time for communication courses that the Church of Scientology promotes so widely, and all you get is a freaked out look and an about face? Tanya: You know since webbing, “A Chat With Anne Marie Dunning” on April 4th, 2005, I have received some inquires I thought I might ask you two about. Anne Marie: Sure, ask away. Tanya: Well I wonder if you know of a Scientology Chiropractor in Williamsville? Anne Marie: Yes, I do. In fact, I know two of them. They are a husband and wife team, Drs. Brian Burford and Lori Milanovich. I believe they are located on Main St. in Williamsville. They are both from Lewiston. Both graduated from Lewiston-Porter High School. Lori began as a filer for Scientologist and Chiropractor, Glenda Rose while she was in high school. She then went on to become an associate of Glenda’s. Brian and Lori dated during high school and Brian was a patient of Glenda’s. She convinced his mom that he needed courses at the Church of Scientology because he believed they could “help” him with his dyslexia. He went on to Palmer college with Lori and also became and associate of Glenda’s. They left her office about seven years ago to open one in Williamsville. It’s called Naturally Chiropractic. Tanya: I see Naturally Chiropractic is listed in the 2004 WISE (World Institute of Scientology Enterprises) Directory. But getting back to Glenda for a moment, it is my understanding that Glenda returned to Clearwater after the Buffalo News series. Anne Marie: Yes, I do find it funny she had to run to Flag because of the articles. I wonder if it sent her into a spin because what we said rang true? She had to be “reprogrammed” so she would question our story instead of Scientology. One of her patients recently informed me that she is claiming that I stole money from her business. If she really thought I stole money from her, she would have pressed charges already. She has in the past pressed charges against another former employee who did admit in court to stealing money from her, she was sentenced and made to pay restitution. Tanya: Oh, you must be speaking of Jennepher. Her mother wrote Andreas Heldal-Lund at his site www.xenu.net back in 1999, looking for help regarding her daughter. Here’s a copy of the letter that was posted. Anne Marie: Yes, that’s her. Like I said, if Glenda really thought I stole money from her, why hasn’t she pressed charges? I believe she was just trying to paint me as a bad person because I was quoted in the Buffalo News Series and I was liked by many of her patients. Tanya: It must be hard for a Scientologist when people around them start to question their motivation. I think I understand the emotional and thought stopping mechanisms that keeps a Scientologist from reading anything critical about the group, but still, if people around them are questioning it, you have to wonder if some of the critique doesn’t start to sink in? That is probably why the Church devotes so much time to countering negative or “suppressive” information and people. They have an answer for everything, a spin, a “handle” as Hubbard would say. It seems to be the main reason for “disconnection”. If you shut down the voices, the criticism, there is left only the feeling of power and success that the Church is so good of filling your head with. Anne Marie: Yes. Disconnection is a very powerful tool for them. Fear is a powerful tool for them. Rich: Intimidation is another tool they like to use. And, yes the Church of Scientology likes to take the credit for people’s successes. But where are they when something goes wrong? They can turn on you so fast, you won’t know what’s hit you. I’ve watched Jeff Carlson do that many a time. Tanya: Seems to me the abundance of knowledge reports that are required by Church management, encourages that behavior. Anne Marie: It really is odd looking back, that as a member you just accept this behavior, for fear of reprimand to dare to say anything critical. Tanya: Here’s another question that was posed to me since our last chat. Do you know anything about a Scientology family whose house burned in a fire and then the Church of Scientology went after the insurance money? Anne Marie: Yes. Bill and Sue Weibert. They live in Youngstown, not far from Fort Niagara. I know they used at least part of the money they received from the insurance company to purchase auditing. I also know that her daughter, who is in the Sea Org, wrote a knowledge report about this. This was right before I left. I am not sure what happened from there. I do know that Jeff Carlson was trying to get them to use more of the money towards Bill’s auditing, but while I was there, Bill resisted. Rich: That would be the good Scientologist in Jeff, it is more important for him to sell Scientology services, than to rebuild a family’s home. Tanya: I suppose Jeff would make commissions off of that sale. Rich: Of course. Commissions and praise from upper management. Anne Marie: Sue Weibert and Julie Graves home school their children in the garage area of Computer Solutions Unlimited. Once I went there to pick something up from Sue and noticed how absolutely disgustingly dirty it was and the place smelled of sour milk. There is no way I ever would have left my kids in their care. Not with the way the “school” looked. Tanya: That is rather disturbing. Especially given the following public statements by Sue Weibert. I can’t believe this is real! This is science fiction, Big Brother, in real life! How did this ever get this far? This legislation hits on every citizen in our country. The rise of our children being put on mind-altering drugs in this country has already been driven to epidemic proportions. Is this coincidental with the rising crime rates of our youth? I feel it is no coincidence. What is the scientific, medical basis for this decision? None, there is no medical testing that can be done to “screen” for mental illness. As a mother of six kids, this hits to my very heart! My one child was deemed by the public school system to be in need of psychiatric intervention and drugging due to behavior in school. I was threatened with being reported to Child Protective Services if I didn’t comply. No academic testing or help was offered, and my request for such was even turned down. Going to private means, I found my seventh grade child had a third grade reading level and a fourth grade level in math. To avoid compulsory mental treatment, we enrolled in an out-of-state private school where the lack of proper basic education was remedied. My child is now grown, married, and a contributing member of society. And for what reason – to support others, who for some obscure reason have been deemed and labeled unfit to contribute? Whose pocket does this legislation line? This is where the insanity lays – the “treatment” of our future citizens with labels and mind-altering drugs for the profit of a few! and/or coerced by school personnel to place their children on psychotropic drugs. 819. Susan Weibert – Youngstown, NY. Coerced/Pressured by a School principal & school psychologist. 820. Susan Weibert – Youngstown, NY. Coerced/Pressured by a Principal, guidance counselor, school psychologist. Tanya: I remember reading that there was a Kari Weibert on the RPF list posted last fall from an anonymous defector. Anne Marie: Well the Weiberts do have six children. Kari Weibert is married to their son, Jason. They are both in the Sea Org out in Los Angles. I know that their wedding was held at the Celebrity Center in 2002. Tanya: Well that fits, that she could be in the Rehabilitation Project Force out at the Big Blue complex as stated by this defector, then. Anne Marie: Four of the Weiberts six children are in the Sea Org. The other two are too young. Tanya: So four of the kids have signed the Billion Year Contract. Tanya: So if anyone of them gets disillusioned with the Sea Org and leaves, they will get stuck with a Freeloaders debt for probably tens of thousands of dollars. Rich: They tried to stick us with a Freeloader debt for leaving staff. When in actuality, they owe us money for hours of work and Scientology services never rendered. Tanya: You should ask for that money back. But I am sure part of the programming is to instill in you a fear to do that. If it were me, I wouldn’t stop asking until they paid me my money back. Speaking of working on staff, I was wondering with all those hours that were required of you, did you ever get a break? Anne Marie: Only short ones. I used to escape outside all the time with the smokers, even though I didn’t smoke. It gives you a little space from the Org. and the craziness. There are a lot of demands on you and you feel like you are running in circles never accomplishing anything. You gain space and don’t feel so overwhelmed even if it is for just 10 minutes. Plus, people are less likely to find you if you are outside for a few minutes. I used to love having to go up to book or promo stock. Ironically, nobody ever found me up there. Tanya: I understand Ron Hubbard was a smoker. Rich: Yep. 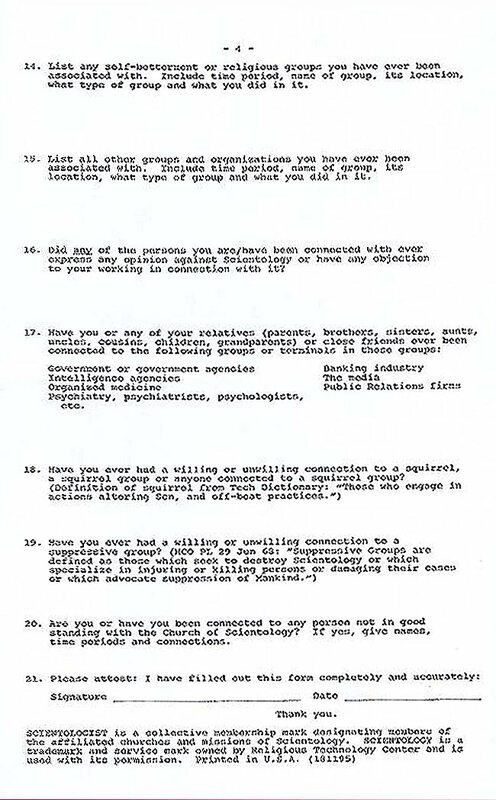 So are most of the Sea Org staff that would often frequent the Buffalo Org. The second floor used to be like a chimney when they would come to town. Most of the Sea Org members smoke and drink coffee like it was going out of style. Yet, Scientologists always claim they are drug free, last I checked nicotine and caffeine are stimulant type drugs. Tanya: Aren’t you suppose to be drug free to receive any scientology services? Rich: Yes. Hubbard’s policies are such a farce. Tanya: Anne Marie, getting back to the topic of the Sea Org for a minute. Didn’t you tell me you were eligible for the Sea Org and Rich you said you weren’t. Is that correct? Anne Marie: Yes, I was eligible to join the Sea Org. 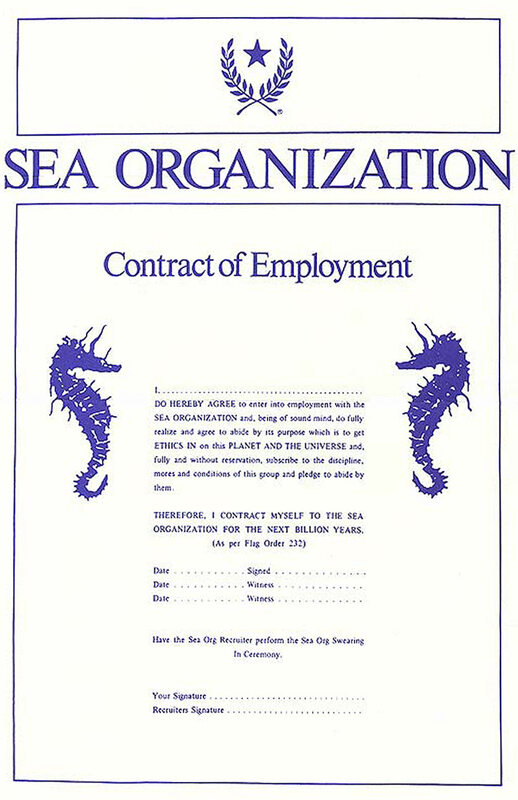 Management and Sea Org would pressure me all the time to join the Sea Org. The problem was that, Rich wasn’t eligible to join the Sea Org. In order for me to join the Sea Org I would have had to divorce Rich. 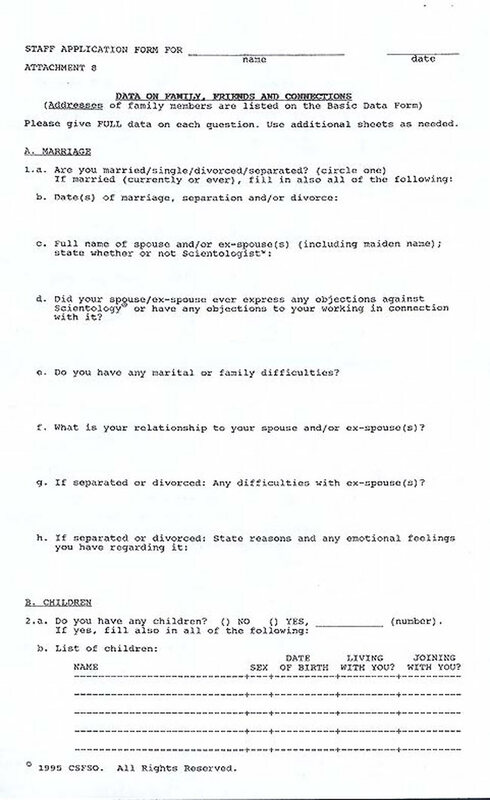 Anne Marie: You are not allowed to be in the Sea Org and be married to someone that isn’t. Tanya: So if you were being pressured to join the Sea Org, then in a sense, the Church of Scientology was indirectly pressuring you to divorce your husband. Yet, the Church of Scientology promotes marriage courses. Anne Marie: Yes, indirectly they were. They were always subtle about it though. I would be told things like, “Oh, too bad your married to Rich, or else you could join the Sea Org” or “You can join the Sea Org if things don’t work out with you and Rich”. So much for making an effort to keep marriages together. Had they gotten my child in, that just would have been one more emotional tool for them to try to entice me to join. Tanya: I was reading the Sea Org application just the other day. There are some really inappropriate questions in it. One has to wonder, why in the world the Church of Scientology management needs that information. Anne Marie: Unfortunately, when in, you are not questioning Scientology. Everyone around you thinks it’s normal stuff. You don’t get to hear anyone questioning the reasoning behind the Church’s behavior. It really is a distorted bubble you are in. 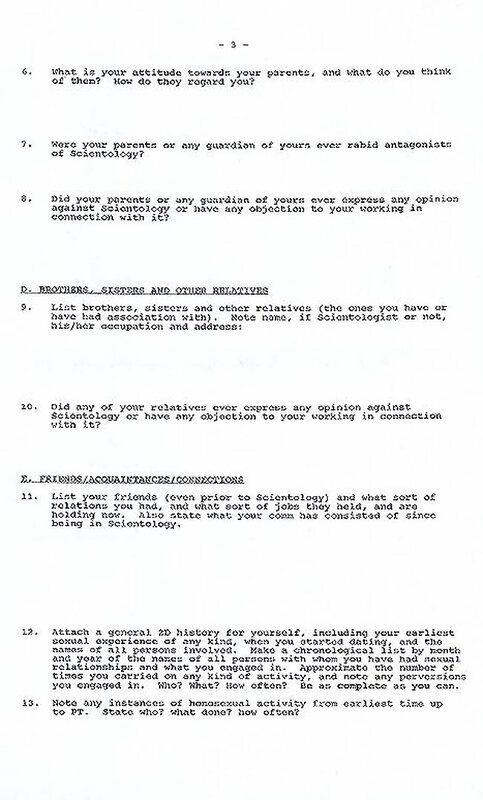 Tanya: I find these four pages of the 31 page Sea Org Application rather offensive and invasive. Anne Marie: Really, it’s none of their business, but it’s a tool they use to identify your outpoints. Things that might be preventing you from going up their Bridge. Rich: That, and what else they want is to identify, who might be influencing your decision making. They want to know that, for better control over you. Rich: Yes, those are good ones. 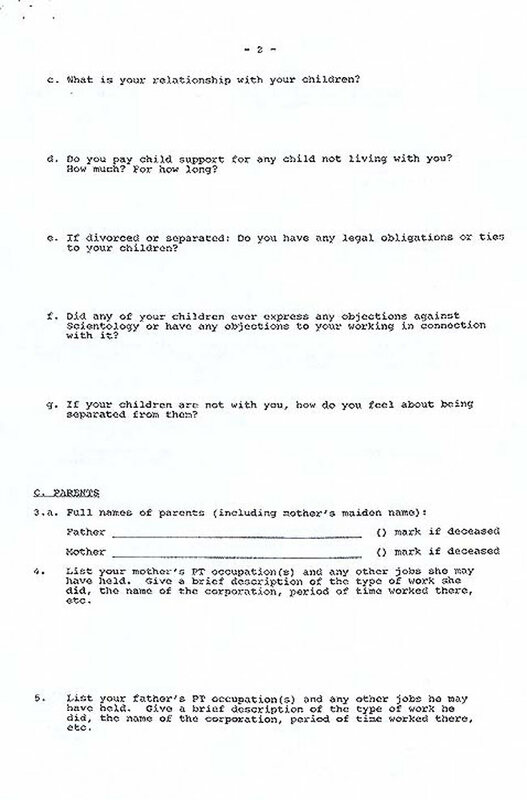 Question 13 asks the applicant to, “Note any instances of homosexual activity from earliest time up to PT. State who? What done? How often? What do you suppose they are going to do with that information? Tanya: Then the Church of Scientology has the gall to copyright the application. Tanya: Well, I’ve got to run, but thanks again, both of you. I just want to add, that if anyone would like to contact anyone of us, we are all available via email.